I am looking for a 2004? 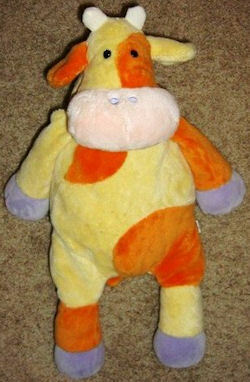 plush cow that is about 9 inches long, made by Manhattan Toys. The cow is orange and yellow and there is a little purple on the feet. My son lost it, and he is lost without it and has a very hard time going to bed without the cow. I bought the larger version about 3 months ago just in case he lost it, and he wants nothing to do with it:(. He’s only going to be happy with the small one that’s about 8 or 9 inches. He is a year and a half, poor little guy. Please help me find this cow! Hi, I am looking for the large Manhattan cow. My son called her Bessy. Please let me know if you want to part with your large cow. We have washed ours so much that it is falling apart.